I'm with you, Anne! That darn Williams-Sonoma is dangerous! I love the store but try to stay out of it since I can be an impulse buyer. I had the pleasure of meeting Chuck Williams at a store opening many years ago,and had him sign a cookbook. What a kind, down-to-earth man! Oh, and I love my pink KitchenAid mixer! And her brother, the pink food processor, and little sister, the pink blender! I couldn't do without them. Well, maybe I could but I don't want to! And I totally agree with you, I would sleep with my KitchenAid if I could, but my husband gets grumpy when I try. And mine is shiny black onyx. That mixer is adorable as its indispensable.. I totally agree! That red mixer is totally calling my name. My kitchen aid is great (silver) and will probably never die either, but if it does, I am running to the store to get this one too! I adore walking around Williams-Sonoma; I don't need a new mixer, but there are always about 10 other little things I would love to buy. Oh well, Christmas is coming- and my birthday. I won't even go in that place. The last time I did, I went a little crazy. And the time before that. I'm so glad they last forever, but it is a little frustrating when you want a new one and you know yours will never die. When I watch Ina, I notice that she must also be using her first one in a lot of the shows because the speed numbers on the side seem to be worn off. And she tests recipes and uses hers more than I ever will. There's no hope of mine dying so I can get this sweet new one. Ugh! I know! I saw this in the latest catalog and was coveting it immediately. I think it's just gorgeous. My current one is black, and it's probably almost 10 years old. Someday...I will get a new one! I would love this one, though. I didn't know how much fun baking was until I got my Kithenaid mixer. Even tho just white, it is Wonderful!! Have you tried Pampered Chef (on ebay) for the little scoop. Mite be a lot cheaper. I have been begging for one for a year now and I think that that looks like one that would look really nice on my counter on the day of my 30th birthday! Awesome mixer bowl! My mom got her first Kitchen Aid not long after they were married and it lasted about 40 years! (Sorry to say. jk) It was actually still grinding away, but just didn't sound good. It need to go. Hers was the lovely pea green soup color! We bought her a nice, new white one. Ha! That's so funny. Is that at Chandler Mall? I think we need story time next week! it's SOOOOO PRETTY! I also have a red one, but I love love love that glass bowl! I'm on my way to get one for my girlfriend for Christmas. 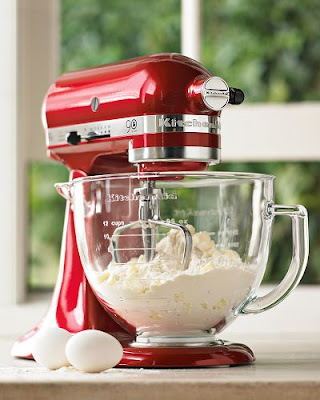 She wants a new KitchenAid mixer and we both love red. I am really excited because I'll get to use it too!